The inauguration of George Latimer as the new Westchester County Executive was held on January 7th at Westchester Community College. Joining Latimer on stage were NY State Governor Andrew Cuomo, NY State Attorney General Eric Schneiderman, US Congress members Nita Lowey and Eliot Engel and NY State Senator Andrea Stewart-Cousins. Latimer was congratulated by each speaker who all stressed a common theme. Latimer promoted a message about civility. The entire inauguration can be found on our website, www.lmctv.org. George Frideric Handel composed his now famous oratorio entitled “Messiah” in 1741. More than two hundred and fifty years later, the composition is played throughout the world in performances during the holiday season. In the Village of Mamaroneck, St. Thomas Church performed the masterpiece on December 17th. Lindsley Barrios went to the church to learn more about the performance. Federal lawmakers are asking the US Army Corps of Engineers to speed up the review process of Mamaroneck’s $80 million Flood Mitigation Plan. A story published on Lohud.com, New York Senators Charles Schumer and Kirsten Gillibrand and Representative Eliot Engel, composed a joint letter to the Army Corps the week of December 4th, that urged approval of the plan. The letter stated, “This plan is technically feasible, environmental appropriate, economically justified, and absolutely necessary”. The lawmakers added, “The Village of Mamaroneck has suffered enough loss, and it is unacceptable to wait any longer to take action”. It has been ten years since eight-foot gushing waters devastated more than three hundred homes and one hundred commercial buildings throughout the Village of Mamaroneck. For more information regarding the push for approval, go to www.lohud.com. In our Round Table discussion, Mike Witsch spoke with Sandy Soler, Family Services clinician; Gladys Perez-Divito, Licensed Mental Health Counselor & CRC Board Member and Sean Paul Wade, Certified Anger Management Specialist about the advantages, disadvantages and myths regarding talk therapy. Village of Mamaroneck Mayor, Norman Rosenblum is saying goodbye after serving the village for eight years. LMCTV’s Know Your Neighbors host, Sunny Goldberg spoke with him to get his fondest memories. Amanda Lucidon, the official White House photographer for former First Lady Michelle Obama was recently at The Voracious Reader in Larchmont. Local Live reporter, Mike Witsch spoke with her about her new book. Rob Astorino, the Westchester County Executive recently held a Town Hall Meeting at the Mamaroneck Town Center to discuss the state of the county. Town of Mamaroneck Supervisor Nancy Seligson introduced the “Ask Astorino Town Hall Meeting”. A presentation was opened the meeting. A Q & A segment was then followed. Astorino spoke on a variety of issues which including economic growth, affordable housing, controlling land use and zoning, Playland, the Safer Community Initiative Against Narcotics, the county’s budget and taxes. The full video of the meeting is featured on our website, www.lmctv.org. There is an update to the new parking regulations for Mamaroneck Avenue. The Village of Mamaroneck Board of Trustees approved a new legislation that will extend parking fee times and extend hours to all meters on the avenue. The new changes will bring the hourly fee for parking from 75 cents per hour to $1 per hour and the parking times will now be until 8 p.m. Trustees Finch, Potock and Miller voted for the legislation while Mayor Rosenblum and Trustee Santoro voted against it. The Democratic trustees hope that the increase in hours and fees will create more turnaround and less traffic all across the avenue. The decisions made at the meeting will not have an effect on what parking meters the board will choose. That decision will come at a later date. We will continue to follow this story. The full meeting is on the LMCTV website. In sports news, two Mamaroneck swimmers were invited to the Olympic trials and one even qualified for the 2016 Rio Olympics. Cody Miller and Jack Collins who are both members of the world-renowned Badger Swimming Club competed in the US Olympic Swimming Team trials that were in held in Boulder, Colorado this past week. Cody Miller secured second place in the 100m Breaststroke with a time of 59:26 seconds, which was enough to secure his Olympic dreams. Congratulations to Cody and good luck in Rio! The US Supreme Court recently voted to deadlock President Obama’s actions to expand DAPA and DACA last week, two policies made to protect immigrants and their families. DACA, or Deferred Action for Childhood Arrival, has so far provided temporary relief to nearly 720,000 immigrants, according to the Migration Policy Institute. This group of immigrants were brought to the US as young children and the policy allowed them to apply for temporary work authorization and to be able to obtain a Social Security number as well as a driver’s license. DAPA, or Deferred Action for parents of Americans, is aimed to help the parents of these children and to give them access to citizenship and working papers. Janet Rolon, the Director of Services at the Community Resource Center, spoke of how the ruling of the Supreme Court will affect immigrants in our area and around the country. Nominations for both Democratic and Republican trustee candidates have been made. Victor Tafur, who was born and raised in Colombia and recently became a US Citizen two years ago. He is an environmental law professor and also serves as Co-Director of the United Nations Environmental Diplomacy Program at Pace University Law School. Keith Waitt currently serves as Chairman of the Village Budget Committee and the Village’s Industrial Advisory Committee. Incumbent Trustee Leon Potok is running for the third consecutive term. He previously served as chairman of the Village Budget Committee as well as the Mamaroneck School District Budget and Finance Committee. Maria DeRose, the current chair of the Advisory Parking Committee. She is also the North American operations manager for Lorenz Life Sciences Group International. Dennis Cucinella is a current member of the Board of Architectural Review and has formerly served at the Zoning Board of Appeals. Joern Malte Stoeckhert is the chairman of the board of architectural review as well as the Treasurer of the German Evangelical Lutheran Church of St. Paul in New York City. In the time leading up to Election Day, LMCTV will host a “Meet the Candidates” show. The program will help you learn more about the local candidates and their future plans if elected as trustees. We let you know at a later date when the show will air. The efforts to save the Larchmont Playhouse by residents is still going strong. The group “Keep the Movies in Larchmont” is led by Ellen Zuckert, Jessica Veith, Vicki Rosenstreich and Elizabeth Bradley. 238 people have already pledged $215,000 in just a week’s time. The group would like to bid on the $1.5 million property and turn it into a non-profit theater like the Jacob Burns Film Center in Pleasantville and the Pelham Picture House. According to the group’s Facebook page, the cut-off date is June 30th, but the broker has given the group an extra week to help raise enough pledged. If you would to make a pledge, please email save-larchmont-movies@gmail.com or sign the petition at change.org to show support for the cause. We will inform you of any updates and changes. This past Monday, around 400 fans of HGTV’s Property Brothers, waited in line to see the Canadian twins Drew and Jonathan Scott at the Barnes and Noble in White Plains. The brothers were in town to promote their newest release entitled, “Dream Home: The Property Brothers Ultimate Guide to Finding and Fixing Your Dream House”. The book is filled with all the buying, selling, renovating information that the brothers have learned over the years. Jonathan and Drew have been filming new episodes of the hit TV shows, “The Property Brothers” and “Brother vs. Brother” locally for about two months. They were even spotted on Mamaroneck Avenue near the Harbor! So be on the lookout, they might just be in your neighborhood! In our Round Table discussion, Maura spoke with Jill Fisher, Town of Mamaroneck Superintendent of Recreation; Steve Josephson, Village of Mamaroneck Chamber of Commerce President; Sandy Korkatzis, Village of Mamaroneck Superintendent of Recreation; Solange De Santis, Village of Mamaroneck Arts Council Chair to find out what’s happening this summer in our area. This week The Mamaroneck Fireman’s Parade made our In the Spotlight Segment. Our Pet of the Week is Calliope, a beautiful and sweet female Lab/Shepherd mix who is about 12 weeks old. She’s such a little doll. When she’s not running around like the spunky, playful puppy she is, she flips over onto her back waiting for belly rubs. She is completely paper-trained and gets along very well with her furry foster siblings. She would love to be in a family with other dogs and children. For more information on Calliope and to browse other adorable pets, go to http://www.ny-petrescue.org. If you like our show and want to help keep us on the air, please support us by check out our website, www.lmctv.org and click on the DONATE button in the upper right. We really appreciate any contribution. 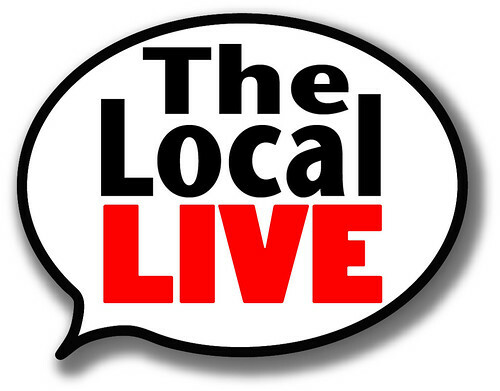 We are always looking for new volunteers and interns, so send your emails to thelocallive@lmctv.org. We love hearing from you.